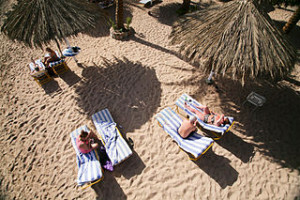 A Northants family of five have successfully received over £7,500 in compensation after falling victims to an alleged outbreak of gastric illness during their eagerly anticipated stay at Nubian Island hotel in Sharm el Sheikh. Parents Stewart and Sharon Morrow turned to industry leaders Holiday Illness Claims for specialist legal advice after their plans to celebrate fifteen years of marriage with their three children at the five-star resort were thrown into disarray by severe non-stop diarrhoea and sickness. Within 48 hours of the Morrows arrival at the 229 room Nubian Island resort, father Stewart was struck by crippling gastric illness symptoms of sickness and diarrhoea. Speaking to the experts at Holiday Illness Claims, Stewart describes feeling incredibly weak and claims that he was unable to leave the hotel room owing to the severity of the illness symptoms experienced. The stricken holidaymaker soon realised that he was in urgent need of medical attention and sought the services of the hotel doctor. Despite receiving a cocktail of drugs through an IV drip and adhering to a schedule of tablets and hydration sachets, Stewart remained unwell for the remainder of his ruined holiday. Stewart was not alone in his suffering however as wife Sharon along with children Luke, Lois and Braydon also succumbed to the same unpleasant illness symptoms and sought treatment from the local pharmacy. Stewart remains incredulous that hotel staff did not appear shocked or bothered by his plight and simply mused that its the heat and that a previous guest must have brought illness with them. The disgruntled holidaymaker adds that he wished we had stayed at home … What should have been an important celebration was ruined by all members of my family being ill.
At the close of their sickness stricken Sharm el Sheikh holiday, the majority of the Morrow family were on the road to recovery. Unfortunately, Stewarts return to health was to prove slower as he remained unwell for a further week on his return to the UK. For the self-employed tiler and bathroom fitter, this meant that he was also afflicted by loss of earnings as he was initially unable to fulfil scheduled works. The Morrows resolved to pursue a claim for holiday illness in Egypt and instructed experienced solicitor Sue Robinson of Holiday Illness Claims on a no win no fee basis. With Sue on their side, the Northants family of five were awarded a total of £7,535 in a settlement with tour operator, Thomson. Commenting on the case, Sue said: I am so happy that I was able to assist the Morrow family after illness ruined not only their family holiday but important anniversary celebrations also. Unfortunately, at Holiday Illness Claims we hear all too often from tourists struck by illness in Egypt. We have now helped British holidaymakers, just like you, recover in excess of £1 million in compensation following ruined Egyptian holidays. If you or your family have suffered from illness symptoms such as sickness and diarrhoea on a package holiday within the last three years, I strongly urge you to contact Holiday Illness Claims to see if you too are eligible to make a claim for damages. Our holiday claims experts can advise you on the merits of your case and guide you through the claims process. With over 50 years experience in travel law and an unrivalled claim success rate, Holiday Illness Claims have the expertise and background knowledge to help you make a no win no fee claim for holiday illness without the hassle. Make Holiday Illness Claims your first choice for legal representation and call 0800 01 54321 now. Or, if you would prefer a call-back, simply complete the online contact form and a dedicated holiday illness lawyer will be in touch within 24 hours.